Found! A Blanking Cover, to replace the spare wheel on a Gen 4 2019 Jimny. A blanking cover, after removing the spare wheel, in a Gen 4 2019 Jimny, any ideas? A look at some of the wharf photos shows the holes are covered with tape. I found this on a web search, but it is for the earlier models. A minimal idea is to use 4 nice domed head 8mm bolts to replace the remaining boss/bracket and cad plated bolts. Another idea is get the local Laser Cutter Shop to cut a square of aluminium sheet with the 4 mounting holes and "Suzuki" or "Jimny" (or "Seniors'") laser cut through the polished alloy to show the paint colour (beige) as a contrast. Last edit: 20 Mar 2019 09:23 by GeorgeC. Replied by Lambert on topic Found! A Blanking Cover, to replace the spare wheel on a Gen 4 2019 Jimny. Almost certainly going to have to be custom made at this early stage of gen4 availability. Nice idea though. Replied by Soeley on topic Found! A Blanking Cover, to replace the spare wheel on a Gen 4 2019 Jimny. Where will you keep the spare, inside the car? Replied by Andy2640 on topic Found! 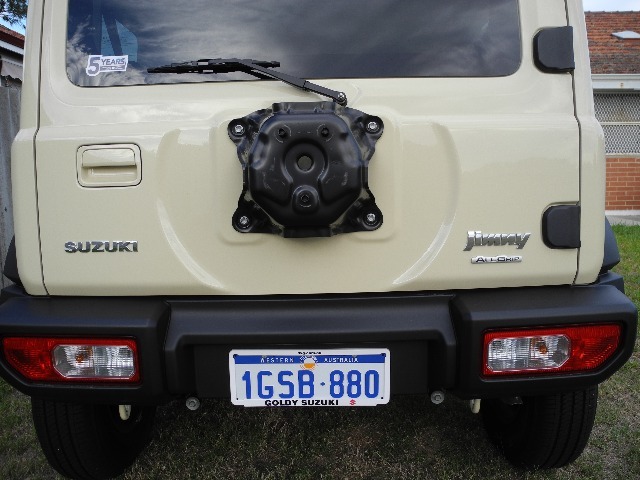 A Blanking Cover, to replace the spare wheel on a Gen 4 2019 Jimny. Yeah, personally i think the spare tire on the back gives the Jimny its unique character. In fact, ive seen the dealer model sat without the spare wheel, and just my opinion - It looks weird and not quite right. Replied by GeorgeC on topic Found! A Blanking Cover, to replace the spare wheel on a Gen 4 2019 Jimny. I was waiting for the "Why?" question. Its about vision, my main reason for buying the Jimny. I do find the rear vision, when reversing, a little difficult. I agree that the spare wheel is part and partial of the character of the Jimny, but for now, I need to try reversing without it. 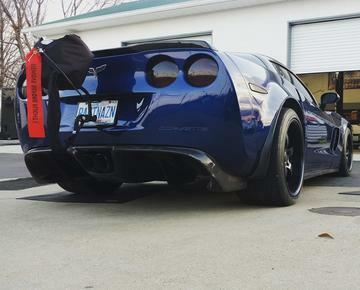 The wheel can live on my back porch, the mounting boss can stay on the car. If I need go any further than the 4-5km weekly shopping trip, it only takes a couple of minutes to re-fit the wheel. I have had some amusing suggestions as to what to mount in place of the wheel, but I'll leave it to the Forum to respond first. Last edit: 18 Mar 2019 16:59 by GeorgeC. I went shopping earlier this morning, a nice lady saw my situation and guided me out of the parking bay. Without the spare wheel, it was not quite the change I had expected. The front and side views from the car are magnificent, even panoramic! Yes, the rear view when reversing is better, but I will need the camera. I will leave the topic up for comment as it may benefit someone else, I will post some of the suggestions later. Last edit: 18 Mar 2019 17:05 by GeorgeC. Reason: Typos, grammar. One of the local fencing contractors used to have a motorised spool thing on the back door of his for winding up reclaimed barbed wire. Kinda cool and abjectly terrifying at the same time. It was like a motorised rope saw for the zombie apocalypse! Replied by MrPaynterZA on topic Found! A Blanking Cover, to replace the spare wheel on a Gen 4 2019 Jimny. I see a weird trend out of India, particularly in the Mahindra Thar community where a lot of guys have smaller, very bling rims with massive tyres. It seems guys just have a naked rim mounted back there presumably because the tyre won't fit and would also block vision. A rim would bolt right up and be smaller thus presumably out of sight? Maybe just one of the red tags and generic black package works? Replied by S200KYS on topic Found! A Blanking Cover, to replace the spare wheel on a Gen 4 2019 Jimny. But to move the spare wheel down rather than up? Perhaps ask JimnyBits if they could try it first before you order? I love the various creative situations in which the Jimny finds itself, more please. S200KYS, your response is so out of the box! Its like the canal boat/low bridge problem, we can lower the water or raise the bridge! On Friday the Jimny goes back to the dealer for fitting the Reversing Camera and the Reverse/Parking Sensors. On Saturday I will re-photograph the rear of the car with the spare wheel fitted and we can check and see if lowering the spare wheel (see Edit2 below) can be done without conflicting with the new electronics. Edit: I measured from all the mounting bolt heads and the wheel hole centre, straight down to a 25mm thick straight edge on the bumper. Top Bolts=385mm, Bottom Bolts=155mm. Centre of the wheel hole=280mm. This places the wheel mount 25mm offset/up from centre of the boss. The un-loaded radius of the wheel is 350mm. Edit2: In short it cant! This means, if flipped, the spare wheel will drop by 50mm, this will conflict with the top view from the Reversing Camera in the bumper! Also the wheel will then be the obstructing the view of the Number Plate. See the clearance photos in the new Post I made on 30 March.